A recent article in The New York Times discussed an initiative to bring fresh, healthy food to a low-income Bronx neighborhood in New York’s least-healthy county. The expectation was that adding a new grocery store in this underserved community would lead to healthier food choices. That didn’t happen. The reality is that just because a greater variety of fresh, healthy food is available, that doesn’t mean people will buy it. Many need help in bringing unfamiliar healthy items from the supermarket to the table. A Taste of African Heritage (ATOAH), a culturally-based cooking and wellness program from the nonprofit Oldways, is doing just this. For 25 years, Oldways, a national food and nutrition nonprofit, has promoted good health through cultural food traditions and lifestyles. Known for their work with traditional diet pyramids, including the Mediterranean Diet Pyramid, Oldways, together with culinary historians, nutrition scientists, and public health experts, introduced the Oldways African Heritage Diet Pyramid in 2011. ATOAH is made possible through a grant from the Walmart Foundation and is a series of classes designed to bring to life the African Heritage Diet Pyramid, introducing participants to the major foods of the pyramid (i.e., spices, greens, whole grains, beans/rice, tubers/stews and fruits/vegetables) and teaching how to easily prepare them. The highlighted foods are not only flavorful and nutritious, but also a posess a long African culinary history. Based on three years of success, Oldways has expanded its national ATOAH program to include a partnership with The NHP Foundation and its subsidiary, Operation Pathways, Inc. The program kicked off this spring for residents in ten of its affordable housing communities across the country. Already, the program is resonating with participants with varied demographics, supporting adults, families and seniors. Recipes introduced are created with ingredients commonly found in local grocery stores, and workshop discussions identify where the highest quality grocery stores can be found locally, and the locations and schedules of nearby farmers’ markets, as well as whether they participate in various food assistance programs. As more farmers’ markets crop up in low- to moderate-income communities, students can take their learning and experiment with other ingredients, for instance, substituting less available mustard greens for collards. For the first time, following the initial six classes, Operation Pathway locations will introduce ten additional workshops, delivered monthly and bi-monthly to offer participants longer-term support and the chance to reconnect over traditional foods, exciting nutrition topics, and continued celebration of heritage. Workshops will share more wisdom from the “old ways,” such as how to pickle and preserve fresh produce, how to eat locally and seasonally on a budget, and how to enjoy water-based African heritage drinks, like teas and fruit infusions. The best news is that ATOAH classes have shown marked improvement in healthy behaviors and biomarkers including increased vegetable consumption, increased cooking, and reduced weight, waist circumference and blood pressure. Measurable positive health impacts come from participants feeling connected to the rich history and healthy roots of African culture and traditional cuisine. 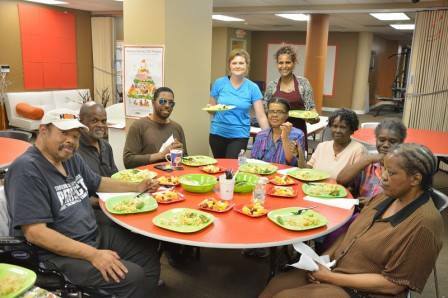 By instilling cooking confidence and teaching basic skills for quickly preparing culturally-relevant regular home-cooked meals, residents discover new flavors and see that healthy foods can be affordable and taste delicious.